Addicting.com parked page filled with links for games. 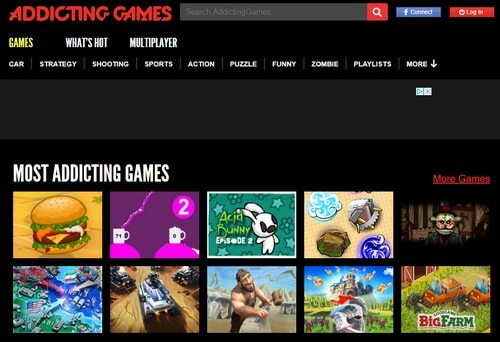 The popular online game site Addicting Games filed an in rem lawsuit (pdf) yesterday against the domain name Addicting.com, claiming that the owner of the domain is cybersquatting. Addicting Games is owned by Bill Karamouzis, who was on DNW Podcast #178. The lawsuit points out that almost all the pay-per-click links on Addicting.com, which is parked at Uniregistry, are related to games. The first link is “Addicting Games”. One big question is when the current owner of the domain acquired it. On February 21, 2018, the registrant of the domain Addicting.com was changed from Domain Hostmaster, Customer ID : 85528474484681 to Savvy Investments, LLC Privacy ID #735277, and the registrar was changed from Fabulous.com Pty Ltd to Sea Wash, LLC. Sea Wasp, LLC is just the business name for Fabulous, so the registrar didn’t actually change. The Whois record is private going back to the end of 2011. From at least as early as 2004 until the record was private, the domain was owned by a registrant in Vietnam. The domain has been parked with Uniregistry since at least 2013. So I suspect that there was not an ownership change this year, although it’s possible. There’s a chance that the domain is currently owned by the same entity that owned it since at least 2004, which is before Addicting Games existed. That said, the links on the parked page (which have been there since at least 2013) are definitely problematic and could present a trademark problem for the domain owner. It will be interesting to see if the owner of Addicting.com defends the domain name in court. David Weslow of Wiley Rein LLP is representing Addicting Games. Have to be as close to your customer as possible so wish him luck but technically is seems addicting.com should be able to do what they want. Hence prime.com, Aws.com, were smart buys as even Amazon, knows this.. Wonder if he offered to buy the asset or work a deal before filing..
Do what they want is a stretch. They can use the domain for something, but games might be covered by Addicting Games’ trademarks. Games can indeed be addictive, it’s an inherent feature of a good online game. Descriptive, as it’s describing a feature of a good online game. Just ask domainers if they become addicted to the “domain game”! jmo. Another example why you should never park a name of value. There are more than a few cases of attorneys screenshoting a pay-per-click adv before filing a UDRP and using it to take the name. More to the point, valuable names should have targeted parking on the dictionary meaning. Absolutes like “never park names” are misguided. There are plenty of converse instances in the UDRP where intelligently parking a name to appropriate subject matter resulted in a win, so it’s not as simple as you suggest. For valuable names, one should use common sense to configure the parking, and avoid parking companies which do not provide the ability to target the parking. I didn’t say never park names. I said never park names of value (especially those worth more than 100K like Addicted.com). That is a misguided use of a valuable asset. Perhaps a photo of heroin and a contact us form would have been the most appropriate content for the owner’s website at Addicting.com. Someone needs to show DTV.com this article. Shame on David Weslow, beyond pathetic attempt. Seems like identity of owner is important. I’ve never heard of “addicting games” but maybe new owner did. Could potentially help establish “bad faith”. Not sure about Lanham Act claim. Addicting.com ppc page doesn’t have same looks or feel of addictinggames.com. There are multiple ppc links to “games” though. Still don’t get why premium domains are being used as PPC landers. Filtering out words, terms, or ads is not 100% fool proof when dealing with technology. Didn’t Bill Karamouzis sell addictinggames.com a long time ago? It will be interesting to see who wins this lawsuit. Thanks for posting the info.